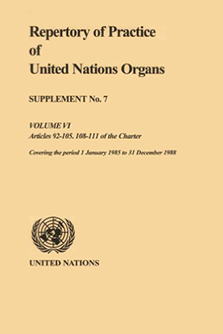 This website provides access to an online version of the Repertory of Practice of United Nations Organs, in the form of individual studies for each Article of the Charter of the United Nations. The Repertory, mandated by the General Assembly in resolution 796 (VIII) of 27 November 1953, is a legal publication containing analytical studies of the decisions of the principal organs of the United Nations under each of the Articles of the Charter of the United Nations. As such, it forms a legislative history that contributes to the knowledge and understanding of the Charter, as applied in the practice of the organs of the United Nations. Its primary purpose was to facilitate the General Assembly’s consideration, at its tenth annual session, of the question of calling a General Conference in accordance with Article 109 of the Charter of the United Nations. The Repertory has since been considered an essential tool contributing to the transparency and accountability of United Nations organs and ensuring the preservation of institutional memory of the Organization, not only for Member States and the Secretariat, but also for research institutions, universities and individual scholars. The Repertory covers the practice of United Nations organs from 1946 onwards. For the period 1946 to 31 August 1954, it consists of five volumes published in English, French and Spanish in 1955 and 1956. In the following years, the publication has been updated by means of Supplements, each covering a period of two to ten years. With a few variations, each study of individual Articles is sub-divided into a General Survey and an Analytical Summary. The General Survey captures the trend in the application and interpretation of the given Article as reflected in the legislative materials of the period. The Analytical Summary identifies or highlights relevant debates within the organization, mainly by the principal organs, on specific questions related to the application and interpretation of the given Article. Repertory studies are prepared by the competent Secretariat units under the guidance of the Inter-Departmental Committee on Charter Repertory (see Annex I to the annual reports of the Secretary-General). Since its session in 1996, the Special Committee on the Charter of the United Nations and on the Strengthening of the Role of the Organization has considered the status of the Repertory, together with the Repertoire on the Practice of the Security Council, on an annual basis, further to the request of General Assembly (see resolution 50/52 of 11 November 1995, and the annual reports of Special Committee on the Charter). By resolution 59/44 of 2 December 2004, the General Assembly requested the Secretary-General to establish a trust fund, which should accept voluntary contributions by States, private institutions and individuals, to eliminate the backlog of the Repertory. The trust fund was established in April 2005. Voluntary contributions to the trust fund may be made by bank transfer or by cheque. Cheques should be to the order of the United Nations General Trust Fund, indicating “Repertory Trust Fund (M1-32CLA-000008)” in the reference field, and sent to: United Nations Headquarters, United Nations Treasury New York, N.Y. 10017, United States of America — Attention: Room No. S-2011. For bank transfer details, please contact the United Nations Cashier by email: unhq-cashier-office@un.org). For any additional information, please contact the Codification Division, Office of Legal Affairs (tel: 1 212 963 5378; fax: 1 212 963 1963). In its resolution 60/23 of 23 November 2005, the General Assembly further "[e]ncouraged the enhanced cooperation with academic institutions and the use of the internship programme for the preparation of studies". As a result, certain studies of the Repertory have been prepared in collaboration with academic institutions or the assistance of interns. Researchers from various countries were involved in their preparation.